Minibuilders' Grip Robot crawls along the lip of the structure, extruding a long strand of marble and polymer composite. Courtesy Minibuilders and Institute for Advanced Architecture of Catalonia. Buildings simply aren’t made like anything else—that goes for sunglasses, furniture, appliances, and fighter jets. No other production process brings massive amounts of material to one place, constructs one item, and then hauls away the garbage. The inefficiencies are monumental. Modular construction has promised a great deal of potential to reduce waste. But what if one answer is to do more intricate construction on-site, not less? 3D printers attached to robots and drones are demonstrating that they might have the versatility to finally bring the unruly building process to heel. The technologies combined for a robot or drone 3D printer may quickly become the peanut butter and jelly of 21st-century fabrication technology. These inevitable pairings promise new levels of efficiency, speed, sustainability, and automation while also posing questions about labor and the nature of design authorship. Earlier this summer MX3D made headlines for incredible plans to 3D print a pedestrian bridge with multi-axis robots. From building skin to Mars exploration, here are four more robot and aerial drone 3D-printer applications poised to both cruise the earth and take to the skies. 1. MUPPette: No Strings Here. MUPPette aerial 3D-printing drone made its debut at the SXSW Robot Petting Zoo. A direct melding of robotics and 3D printing that looks a bit like a remote-controlled toy, MUPPette was designed by Tam Tran and Jared Shier at Gensler. Their six-rotor drone navigates with a laser range finder and GPS sensors, carrying a gravity-assisted spiral material conveyer to extrude concrete. 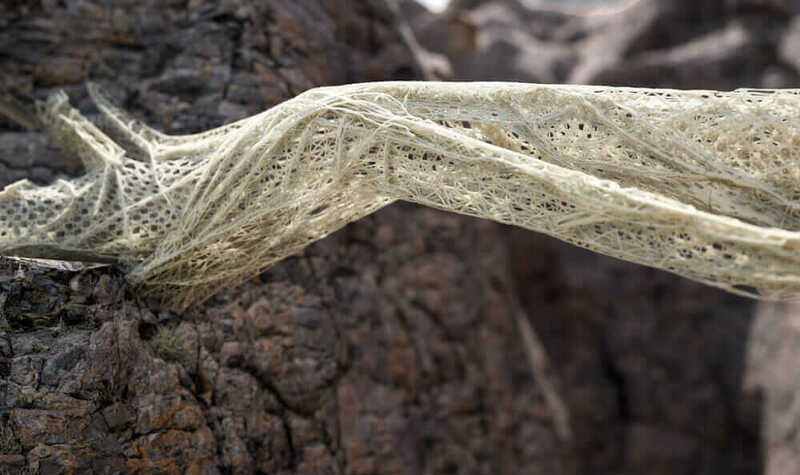 Ideally, Shier and Tran say, 3D-printing robots could solve this problem by using a material that is both structure and skin, an enduring dream for architects since Modernism. Such a solution would fulfill the original Bauhaus desire for formal and organizational minimalism and would bring added material efficiency. Minibuilders’ Vacuum Robot uses a suction cup to stick to the surface of the structure, adding vertical reinforcement. Courtesy Minibuilders and Institute for Advanced Architecture of Catalonia. Unless a few robots designed by Novikov and his team intervene. 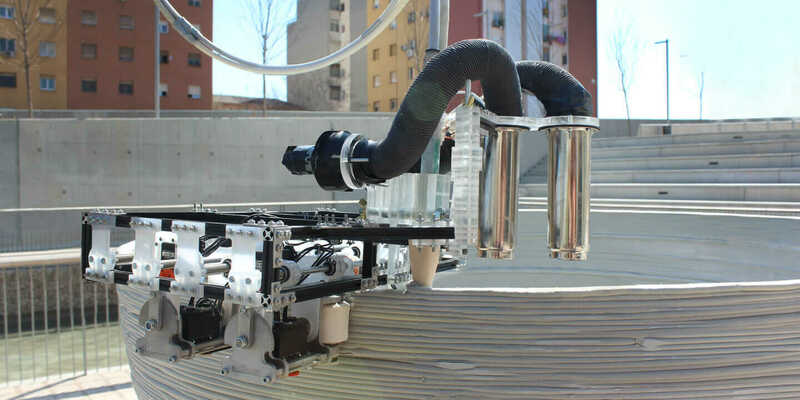 Trained in architecture and robotics, Novikov was one of the lead researchers at the Institute for Advanced Architecture of Catalonia for the Minibuilders project. Along with lead researcher Sasa Jokic, Novikov and their team designed a three-robot system that can build human-scale structures out of a marble and polymer composite. Ironically, the team’s graceful and sophisticated solution didn’t convince Novikov that it’s a universal construction application. He sees this technology as more of a specialized tool. Developing better printing materials is an all-consuming mission for anyone working in the field, and Novikov sees the lack of reconfigurability with 3D printing as a major downfall. But, “It’s definitely useful if we’re talking about construction in irregular environments,” he says. 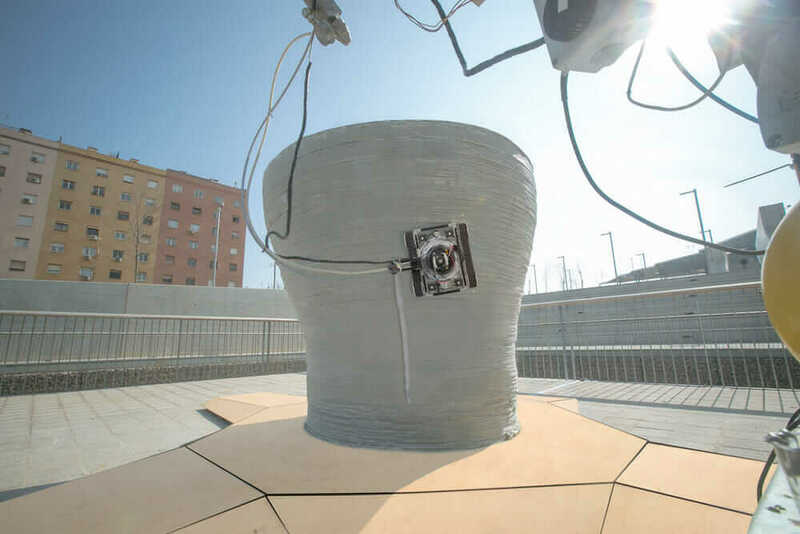 In remote or extreme environments, where there is no existing modular tile set to build with or it’s unknown what the terrain will be at all, the customization afforded by on-site 3D-printing robots is ideal. Examples go from the merely inhospitable (a desert) to the off-world (a moon base or Mars base). The more difficult the terrain, the more practical it becomes. NASA happens to agree. It recently launched a $2.25 million competition for technology that can be used to 3D print habitats using recycled or indigenous material. 3. Swarmscapers: Printing a Connection Between Design and Construction. California College of the Arts (CCA) professor Jason Kelly Johnson’s student-led Swarmscapers are a model of how 3D-printing, autonomous robots could harness native on-site materials in a scenario envisioned by NASA. California College of the Arts Digital Crafts Lab’s Swarmscaper. Courtesy CCA and Jason Kelly Johnson. 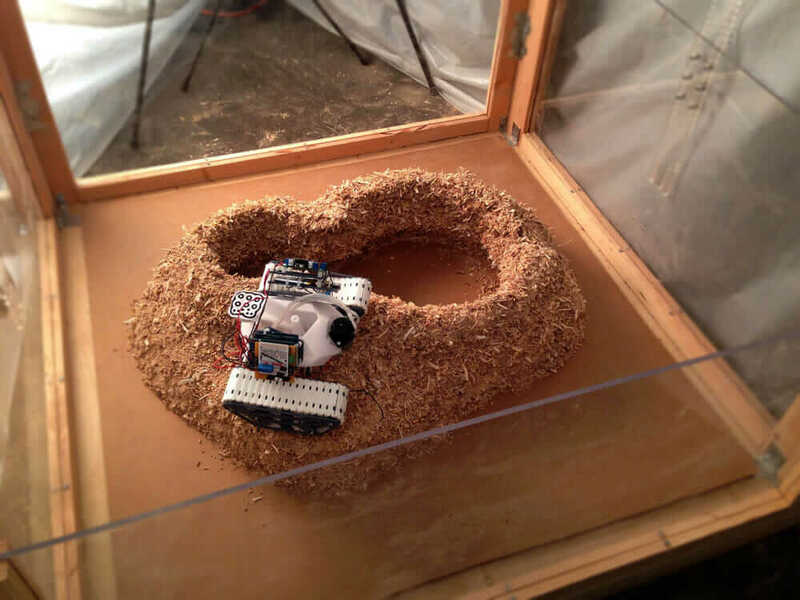 As part of CCA’s Digital Crafts Lab master’s program and its Creative Architecture Machines initiative, Johnson and his students created a series of duo-tread robots that are placed in a chamber filled with sawdust. Traveling in a loop, they use extruded glue to bind together layers of sawdust while a fan kicks up enough ambient material to cover each layer of glue. This completely open-source project creates ovular cone clusters, similar to termite mounds. Johnson’s next master class, co-taught with engineer Michael Shiloh, will explore how to create structures that combine more than one material element or function. Even the simplest building contains structural elements, interior and exterior finishes, electrical, plumbing, and lighting. 3D printing is mostly the extrusion of a single element. So how does one turn that into a wall and attach a kitchen sink? “Our short-term goal is to investigate the coupling of two of those things—to look at how water could be integrated into a building skin and how a robot might navigate it,” Johnson says. Most fundamentally, Johnson sees 3D printing and robots reducing the gulf between design and fabrication: the blind spot where time and money get wasted, and new creative possibilities exist. “The way that architects are designing is getting closer and closer to how things are going to be fabricated and constructed,” Johnson says. 4. The Thread and Aerial Robotic Bridge Construction: Designing the Process. Johnson wants to see 3D printing and robots reduce the gap between design and construction. London Architectural Association (AA.DRL) professor Robert Stuart-Smith wants to collapse it entirely. Prototype printing for the Aerial Robotic Bridge Construction program. Courtesy AA.DRL Studio. 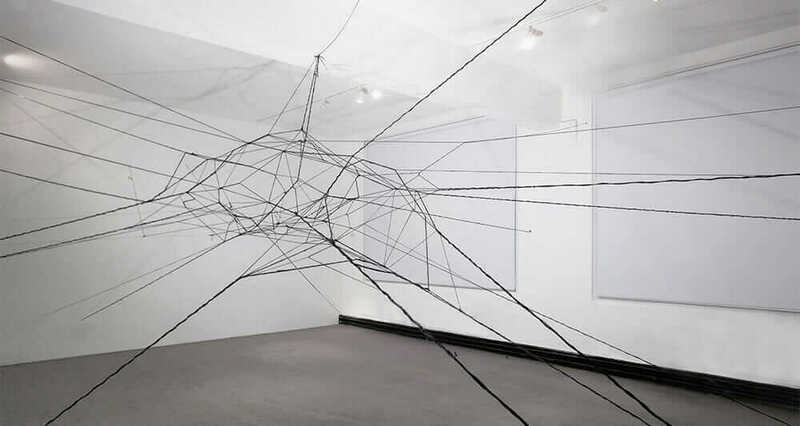 An architect and researcher who runs a Masters studio at the school, Stuart-Smith’s work focuses on back-end programming and algorithms that control aerial 3D-printing drones, allowing them to automatically revise and improvise the designs they’re creating. 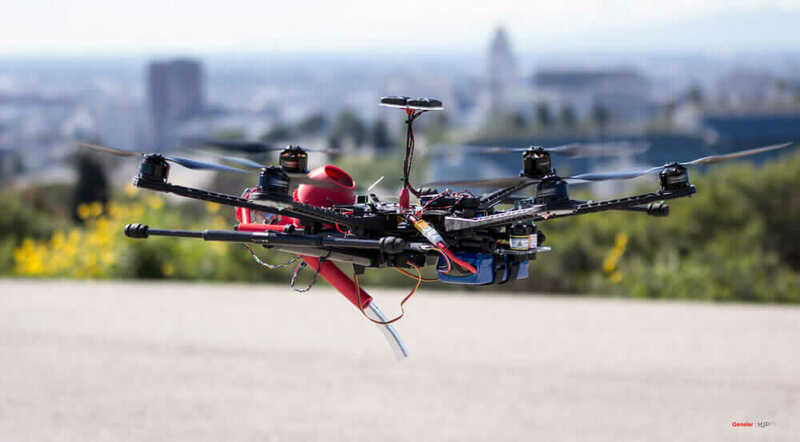 He envisions swarms of aerial drones using autonomous, collaborative decision making to descend on a building site with a basic template in mind, altering it on the fly to better suit the site. “More than half the design is happening in real time,” Stuart-Smith says. The Thread. Courtesy AA.DRL Studio. Stuart-Smith foresees drones troubleshooting their designs as they go along, smoothing out errors and imperfections and planning ahead, building structures without any need for human supervision. He says this level of automation will bring increased accuracy, as well as material and energy efficiency. It’s easy to see armies of robots redlining and revising architects’ work as both a technologist’s dream and an architect’s nightmare. But assuming architects are the ones programming these 3D-printing drones, Stuart-Smith sees architects not as master builders, but as expert coders, setting the parameters for what’s to be built. The idea presents an architect not as the author of a structure, but as the author of a more powerful process. Keep upon the latest construction technology trends with Redshift.